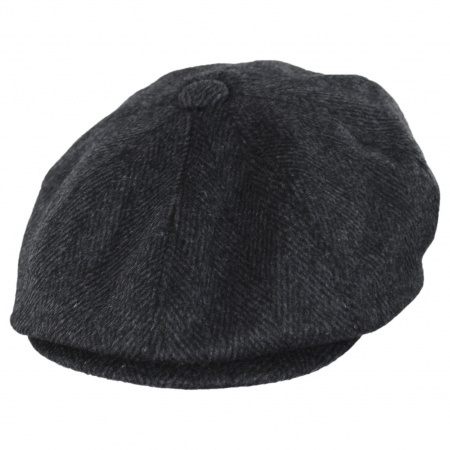 The Large Herringbone Newsboy Cap by Jaxon Hats features a bold large herringbone pattern in dark charcoal and black. 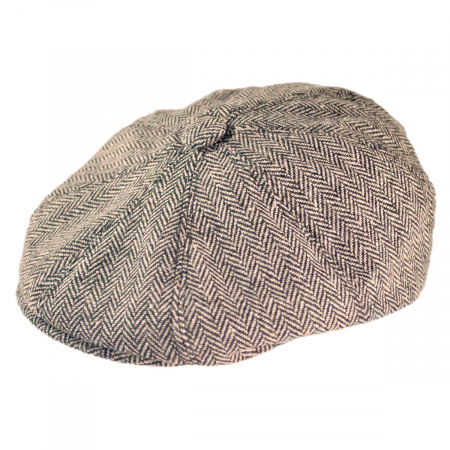 Constructed in a classic 8/4 newsboy style, the Jaxon Hats Large Herringbone Newsboy Cap has a snap bill which you may wear snapped or unsnapped. 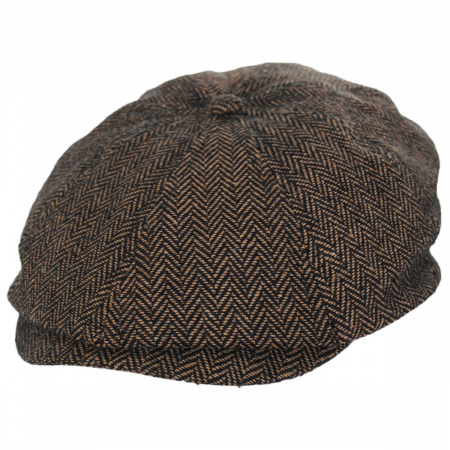 Bold and unique - the Large Herringbone Newsboy Cap by Jaxon Hats is a different take on the usual herringbone patterned caps. Exactly as described - great fit! the cap met my expectations. have recommended it to others. 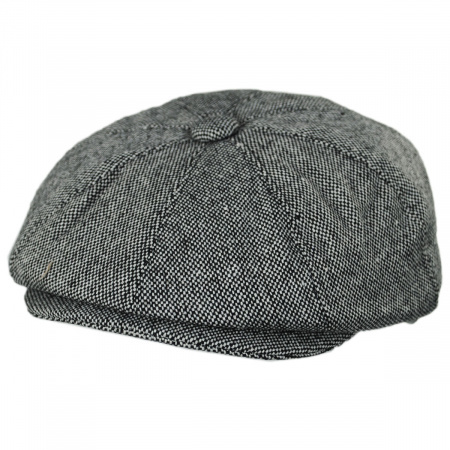 Once again, the Village Hat Shop has exceeded expectations with another quality product. I can’t say enough, great description, smooth transaction, never a problem! Quality! Quality! Quality! Hat was way to BIG. XXL size is my hat size on all baseball hats. XXL size is not my size in this model. Gave hat to Goodwill. Another great cap from jaxon. Nice color fits perfect. Fast shipping from vhs. Great color, great fit, great price. I'm not sure if I remove the white thing under the brim. Arrived quickly. I would have preferred it shipped in a box or stuffed with something to keep it's shape while shipped in a bag. The hat is very nice for the price but the packaging could have been better. I would have liked to have had a Jaxon box or even one from the Village Hat Shop. This hat looked great on my husband! This is the perfect newsboy cap. I bought it for my husband to wear to a 1920's party and he looked great. It really fit in with the theme. I just hope he will use it beyond the party! I love this hat, everything about it is perfect. I am quite satisfied with the cap's distinctive appeal of looking like a more expensive cap, suitable for business or social occasions. 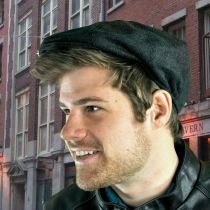 The Newsboy cap made by Jaxon is a well made hat. it fits my son well, and is warm, comfortable, and stylish. 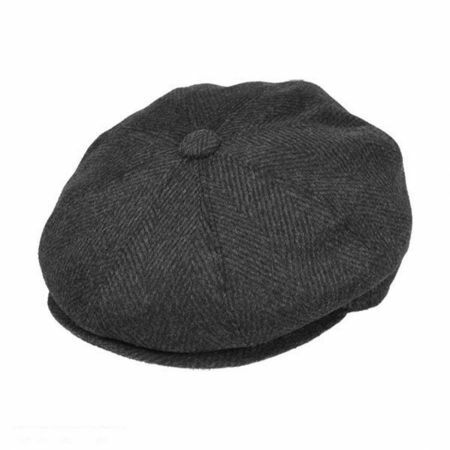 My husband has this cap and a few others, and I have some berets and beanies - all from the Village Hat Shop. We love our hats, they're great, and we love the customer service at least as much. The folks at the Village Hat Shop have gone above and beyond to make sure we're happy. They've won our patronage for life! Thank you, Village Hat Shop, you're the best! The hats were for my vintage wedding. I told the groomsmen they only had to wear them for a few pictures, but they ended up wearing them all night. Hats were shipped VERY quickly. We ordered sizes based on the chart and they were a size too big. We had to return them and order new. We could have done an exchange, but didn't have time to wait for the return to be processed and then new shipping. New hats shipped quickly again and the credit was applied within a day or so of being received. While my girlfriend and I have differing opinions about this cap, I think it's a winner. It's oversized by design (if your head measurement is on the cusp, go with the smaller size. I wish I got a medium), which gives the wearer a cool, youthful appearance. It'll go great with a cold-weather jacket. 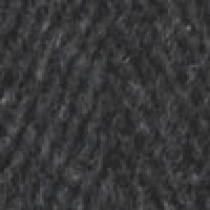 The charcoal color is quite dark - I wish it were a little lighter, so the pattern was more visible. But if you've got the right head, you're gonna look great in this hat. Good price, too. Great hat for a great price. It's on the large side - if your head measurement is on the cusp, I'd go with the lower size. VHShop had the hats on my doorstep within days. GREAT job on their part. Hello hat lovers. My favorite newspaper boy style lid has been my choice for years. When I find a good quality hat I am glad. Jaxon is a quality hat. Village Hats is also a pleasure to do business with. Once you figure how the sizes run your fine. I purchased 2 lately. One being what the description stated was ""large"" . Again , both were size (L) large. It's odd that the one that stated a larger style was actually tighter and smaller. Back in the day , in Brooklyn , we wore this style in an oversized fashion. Almost to large . These days I'm happy for a normal to regular cut in the hat. Just know that they seem to run small in size and style. My size L was surely tight. It loosened a bit after wearing it though. Both of them I recently purchased were cut small. Next I will try XL. In any event , Village hats is who I will deal with because they are fast to deliver across the country and the item arrives neat and clean. I always stuff the hat with plastic bags , wet it then let it dry overnight to shape it and reduce wrinkles from shipping. I found a good store with many nice styles. Not to mention very reasonable pricing. Village Hats online store. Another poster mentioned that the hat fit better with the plastic brim shaper taken out, it worked for me .Overall a nice hat ! Terrific fit...size does matter and this xl hat fit my Xl head. I liked the price and quick shipping too. I would definitely shop here again. This is just the cap I have been looking for. It is a slightly larger diameter than other newsboy caps but not the giant size of the Big Apple caps. It is well made, and the color goes with most anything. Fit is as expected. Excellent quality for the price. Highly recommended. I loved it. Perfect product. I am very pleased with this hat. Its very stylish and warm. What I was looking. Fit perfectly. Perfect fit, warm, very comfortable. This is the first hat I have purchased from this site and it will not be the last. This was my first purchase from VillageHatShop and it won't be my last. Comfortable to wear - looks great ... and it actually fits my fat head! !I've tried so many different hats (that weren't baseball style caps) from many online hat retailers that just never fit - no matter what size they claimed it was. Pleasantly surprised that this one did! Will purchase again for sure in the future. The hats I purchased were very well made, and very stylish. A good quality product for the price. You can't go wrong here! I WAS VERY PLEASED WITH THE HAT. IT WAS REALLY MUCH BETTER LOOKING THAN I EXPECTED. HAT WAS PURCHASED FOR A CHRISTMAS GIFT. FAST SHIPPING WAS APPRECIATED. Loved the cap. Loved the speed at which it arrived. Thanks so much. 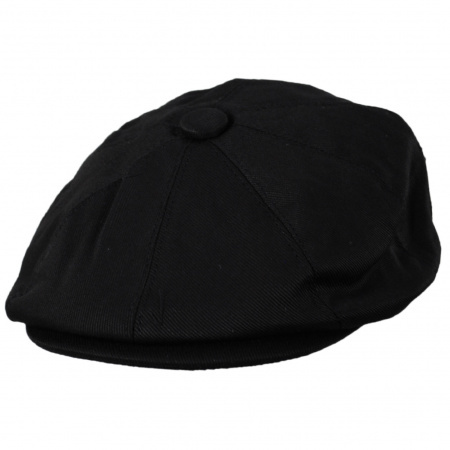 This is a very attractive, comfortable cap. The sizing was just right, and it is well made. I will shop here again. I bought this for my husband because he likes this style of hat. It fits perfectly and looks great on him. Very cool hat and the best price I've found. Fast shipping too. Great hat for the price. Very comfortable. I was looking for one in a dark charcoal color. This looks and feels great. Love the hat. Plan to buy more. 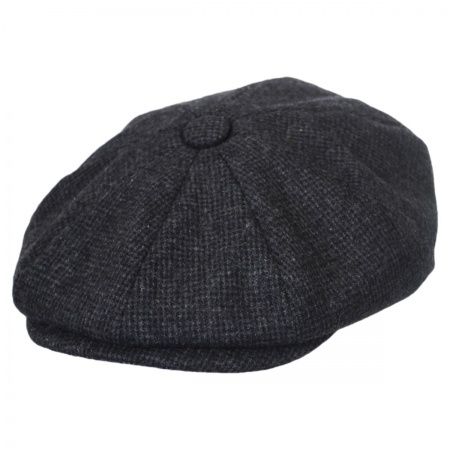 A very nice hat for the price, very soft and comfortable. I would order alot more from VHS but I do not care for UPS. Regular mail would bring me to visit more. Love this hat and it fits perfect. Hat looks cool when worn backwards too! I sort of collect caps a little faster than I loose them. I tend to loose about 1 per yer. I like this hat a lot, and will buy my next ones from VHS. I think the sizes run a little smaller than the same size by different makers. The hat is fine, but I do wish Village Hat Shop would revise its shipping method to accommodate customers in Alaska. On my original order the only shipping method was UPS and cost almost as much as the hat. After sending a complaint to customer service, the hat was mailed to me USPS Priority for about half that. I'll return for more hats if I have more choices for cheaper shipping. I don't care if I look like Sean Connery, or more like Huntz Hall, this is the cap I've been looking for! I love the way it drapes, and the fit is perfect. This is a steal. Hat fits great, looks good, and was perfect for my needs. I always wanted a hat like the one Sean Connery wore in ""the Untouchables"". I'd say this is the one. Nice hat. Fits like it should.